You can set passwords to restrict other users’ access of your computer to prevent any private and confidential data or files from being read or copied . However, in some occasions when you lend you computer to others, your highly confidential data might be exposed to risk if the borrowers have bad intention. To ensure your data are well protected, another layer of security you can adopt of course is to encrypt these important files and set passwords to access them. There are various data encryption tools that users can set their hands on in the market. Some are free whereas some are costly. 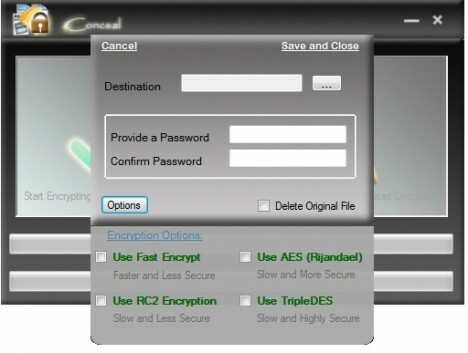 Conceal is a free encryption tool for Windows that users can consider if they are looking for a free and user-friendly encryption software application. Compatible with Windows XP, Vista and Windows 7, Conceal is an encryption tool for users who want something simple yetdo not want to compromise on functionality. This encryption application features a simple interface with two panels for encryption and decryption respectively. Users do not need to have complicated skills to encrypt and decrypt their data. Everything can be done by just dragging and dropping the appropriate files to the respective panels: encryption panel to encrypt data and decryption panel to decrypt data. Besides that, users can also double click on the relevant panel to browse files for encryption or decryption. Once users have dragged or selected the files for encryption, users will be prompted with a small option window to select the type of encryption algorithm as well as the destination path of where users want to save the encrypted files. Users will also be requested for the encryption password. Users can check on the tiny icon “Delete Original File” if they want to delete the original file and keep the encrypted copy only. Once users have done this, they just need to click “Save and Close” to proceed. Conceal can be downloaded via the link here. This Windows application is approximately 2MB. Users especially who need to share their computer with others can get this encryption application to work for them to keep their important data secure.